﻿ Victoria Beachcomber Resort & Spa Pulau Mauritius. JIMAT di Agoda.com! Ada soalan mengenai Victoria Beachcomber Resort & Spa? Menawarkan penginapan yang berkualiti tinggi di daerah pantai di Pulau Mauritius, Victoria Beachcomber merupakan pilihan popular untuk kedua-dua tujuan perniagaan dan percutian. Hanya sejauh 60.00 Km, hotel 4.5-bintang ini boleh diakses dengan mudah dari lapangan terbang. Tidak kurang hebat adalah akses mudah hotel untuk ke pelbagai daya tarikan dan mercu tanda bandar, seperti Tapak Diving Stenopus, Tapak Diving Caravelle, Tapak Diving Ancre Perdue. Beachcomber Hotels terkenal kerana perkhidmatan yang berkualiti dan kakitangan yang ramah, dan Victoria Beachcomber ternyata seperti yang dijangkakan. Semasa menginap di penginapan yang indah ini, tetamu boleh menikmati khidmat bilik 24 jam, Wi-Fi percuma semua bilik, pengawal keselamatan 24 jam, khidmat pos, khidmat teksi. Masuklah ke salah satu dari 254 bilik tetamu kami dan tenangkan hati anda dengan pelbagai kemudahan seperti televisyen skrin rata, rak baju, kopi segera percuma, teh percuma, bilik persalinan yang boleh didapati di beberapa bilik terpilih. Di samping itu, pihak hotel menawarkan aktiviti rekreasi untuk memastikan anda mempunyai perkara untuk dilakukan sepanjang penginapan anda. Victoria Beachcomber merupakan pilihan yang bijak bagi pelancong ke Pulau Mauritius, menawarkan penginapan yang santai dan mudah setiap kali. Tawaran bulan madu mengkehendaki tarikh perjalanan dalam lingkungan 1 tahun dari tarikh perkahwinan. Salinan wajib sijil perkahwinan hendaklah dihantar kepada pihak hotel untuk pengesahan. Tetamu perlu membuat bayaran tambahan terus kepada pihak hotel sekiranya tidak layak untuk tawaran atau gagal menunjukkan sijil perkahwinan yang sah. Kanak-kanak berumur 6-17 tahun akan dicaj EUR 70 seorang satu malam termasuk katil tambahan dan sarapan. Waktu siang - Pakaian kasual. Malam - kasual kemas. Tetamu lelaki dikehendaki memakai t-shirt atau t-shirt polo dan seluar panjang dengan kasut yang bertutup. beautiful beach, exceptional food and best staff, especially volley ball staff, my husband had best time playing with the team. Very nice hotel in a beautiful location . North western corner of Mauritius will increase the possibility of sunshine as weather usual builds up further inland and on the southern parts of the island. Fabulous sunsets. Restaurant all very good with good variety of food. We had a all inclusive package and we were not disappointed. Especially the Italian restaurant was really nice. Many children during our stay so we used the fantastic beach with great pleasure. If you are a couple and preferably stay without and playing children book on Victoria for two, the part of the Hotel has only for adults, super nice. All other activities such as tennis all water sports were good as well. Nice gym and pool table area. In all a really nice hotel. The only ting that was a bit confusing was that the some groups of staff needs to smile a bit more and realise that they are working in the service business. In all the staff was really nice and helpful. We truly enjoyed our stay . We were overwhelmed with the warm and supportive hospitality. We were granted many discount vouchers and even got lunch free for the whole of our stay. The three restaurants are very good and the atmosphere of the hotel is very enjoyable. We recommend it and would love to go back! Hotel property: 5/5 Rooms & facilities: 4.5/5 Room Prices: ₹₹₹₹ Service: 4/5 Food Quality: 4/5 Food Rates: ₹₹₹₹ Stay at this hotel was the best part of my entire trip. 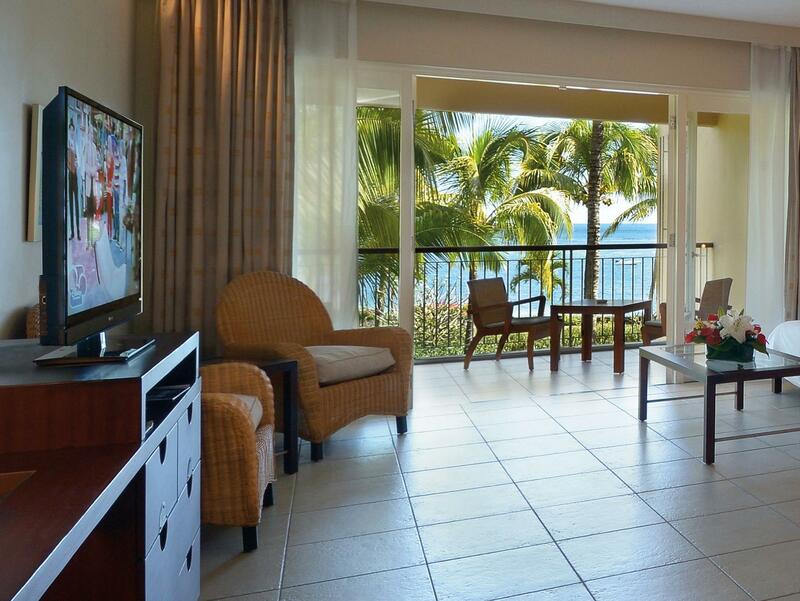 Right from the beaches to the grounds and lobby, The hotel property is spectacular. The property is vast and spread out along a wide stretch of private beach which is really beautiful (though it is rocky in some places). We had opted for Deluxe Sea Facing rooms. While you do not get a clear view of the sea owing to the palm trees, the rooms are excellent; very spacious and of high quality. We got the first floor rooms which were great. The ground floor rooms provide direct access to the garden from the balcony. While the food quality was excellent they had very limited Indian options; majority of the items on the menu were of American or European cuisine. Apart from this the only negative point was that they charge you for water during dinner (even though dinner was part of our half board package). The staff was very courteous and always available to offer their help. Reserved a ground-floor room,on the day of the check-in NO ground floor available,they put my and family on the 2 floor,for 2 days,after that for me is the end,i have lost the mojo and confidence in the beachcomber.FIRST AND LAST TIME !!!!! Everything about the resort was amazing. We stayed 3 nights in the beginning of December, with Half Board plan. Room: good size, clean, furniture a little old but in good shape anyway. Lighting was poor. Bed mattress not very firm, but ok. Pillows a little to hight for me Good bathroom, good light, very clean towels. Most hotels provide some complimentary water in the rooms, at this high price. The breakfast and dinner buffet has been very disappointing. Very mediocre offering, compared to other hotels in another parts of the world. With Half Board you have water and canned juices in the breakfast. At the dinner no water complimentary. The gardens and general grounds are now looking poorly maintained. Very few flowers ! Only one pool, not very big, for hundreds of rooms. Only two a la carte restaurants, you need ro reserve with a least two days in advance. We ate only one night at fish restaurant because of this sistem. At check-out time no bellboy help us with our luggages and the elevator was not worked for two days. Housekeeping, cleanliness etc no issue. Great water sports. They tried to hard sell us a full board package for about 75 Euro per person per day. Good thing we did not as service was bad, buffet food selection poor so we ended up going out for most meals. There was no drink service at the beach - very disappointing, and minimal service at the pool too. We encountered a very rude front desk staff but the duty manager set that straight. The dolphin experience we had by hiring a third party was awesome. We rented bikes from the hotel but was very disappointed as they were in terrible condition. Overall a letdown for the amount of money I paid. Beautiful hotel, great facilities and superb staff. Nice facility; A la cart dining requires reservation; otherwise fixed price buffet. Nice coast line but swimming is challenging due to seabed consisting of seashells and dead corals. Food, room and water sports! The stay was great! The only thing my wife and I were missing is some action during the day time. There is no music throughout the hotel. Only live music in the bar in the eveing. I strongly suggest to have some background music playing at the pool during the day :) Everything else was great! First of all Reception was very helpful. The Garden facing Room is perfect for families. If your kids have no problem sleeping with music prefer the rooms beside the bar which is 120-9 series which is also close to car park (if you rented car) and close to restaurant. Breakfast is good but can be better/change add some(can be boring after some days). Dinner is good everyday different cuisine. Prefer Half board or all in. Hotel is close to famous beaches also. Music Band is really good. Hotel is old but well maintained . I'd like to give 5 stars. Me and my husband, as a honeymoon couple, only spent one night here, but we were quite surprised with the best hospitality providing special honeymoon packages. The sunset, night pool side view, and the sea food buffet were just memorable. Just one thing, this could be great those who plan to have wedding with many guests, or families. The sand of the beach is rough and not good for swimming as it is too shallow. Despite our arrival when it was quite crowded and concierge was really busy, everything went smoothly. The Victoria hotel is a great value for money hotel. Very good breakfast buffet, house keeping is one of the most efficient in MRU. We loved it. Went single with my young daughter (6 years old). She was delighted with everything and had plenty of fun between beach, swimming pool, kids club and evening events. Myself took it pretty easy and did not have too many expectation. I believe you'll love it in couple or with full family. Be sure to go with a half board or all inclusive package as I found it to be pretty expensive when you decide to have dinner at the restaurants. Fortunatly the head of staff of one of the reaturant would always discount my daughter's dinners, thanks!